Image modified from Illustrated textbook of Paediatrics, 4e. Most babies begin to crawl between the ages of 6 to 10 months. If a child has an early neurologic problem such as cerebral palsy or brachial plexus injury, both doctors and therapists seem to put a lot of emphasis on teaching a child how to crawl. My opinion is quite different. Crawling may be part of a normal sequence of development but it certainly is not necessary for a child to crawl before they walk. 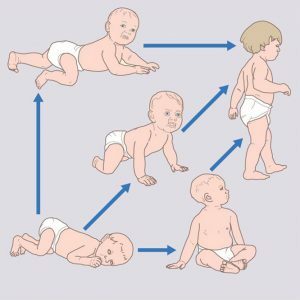 If you look at the occurrence of “normal” developmental milestones in the general population, a significant number of children, estimated to be about 30%, never crawl. These children go straight from sitting to standing, cruising, and then walking. Other children use alternate means of moving independently. Bunny hopping, bottom shuffling and bear walking are commonly seen. It is hard to justify calling “hands and knees” crawling necessary when many children skip the phase entirely. This mother is absolutely correct. Her child is habituated to commando crawling. He can do it efficiently to explore his environment and it will be difficult for him to move to the next stage. At age 20 months, children like to take the easy way out whenever possible. The question to ask is whether his particular pattern of commando crawling is a reciprocal commando crawl or is it a belly crawl with less involvement of his hemiplegic side? I suspect that his pattern is not fully reciprocal, as most children with hemiplegia will use the uninvolved side more than the affected side. This produces a “lop-sided” commando crawl. This pattern is bad news, because it means that the child is practicing an abnormal movement pattern. I call this Learning How To Do Bad Better. If he is using both sides of his body reciprocally when commando crawling, then relax because he is practicing a normal pattern. He will get up sooner or later. For a child with hemiplegia, it really isn’t necessary to get the child to use a four point, hands and knees crawl. All children with hemiplegia eventually walk and the earlier they get into an upright pattern, the better it will be, both for habituating the upright posture and for the normal growth of the leg. Walking on the leg helps the big bones grow. He may well need an AFO for extra support at the ankle, because keeping the foot straight and the weight properly aligned is important. To get a child upright, I would spend time practicing lifting the upper body, first onto a stair and ultimately up to a couch. Once the child can stand, encourage moving from side to side along the couch. It is perfectly okay to pick him up and stand him against the couch and then encourage side-to-side movement. The goal is to get him to realize how much more he can see and how much easier it is to move in an upright position. Once he can cruise well, get him a weighted push toy that he can push around the house. My son is almost 12 months with right hemiplegia. He has been commando crawling for about 4 weeks, but pretty much only uses his left arm to pull himself along. I fear this is forming a very bad habit. What do I do? I have read that getting them moving is so important as it’s critical for cognitive function, I am every worried. ANSWER FROM DR. PAPE:A varied environment and exploration are important for any child, but that has to be balanced by inhibiting bad habits forming. A one-handed commando crawl is not a good idea. Work on more sitting play and standing. All children with hemiplegia walk and that should be your focus, not crawling. A TheraTogs is a great idea to help him develop some balance without as much overflow tone. Alas I have finally found something to disagree with you about – although only marginally of course. In my opinion, crawling on all fours for a child with hemiplegia is even more important than crawling for a baby without difficulties – provided of course, that you can get in EARLY, before the baby establishes commando crawling as a way of getting around (before 10 months of age, but the earlier the better). The reason I say this is that there is really no other time in our lives when we take weight through the shoulder girdle in such a dynamic activity. A GOOD crawling pattern will provide unparallelled opportunities for stimulating that hemi hand and shoulder in terms of strength, sensory input, coordination etc. etc. But having said that – yes, if commando crawling is well established or the baby reaches an age where walking is expected developmentally, then I must agree with you that spending hours on trying to achieve crawling on hands and knees is detrimental to the developing muscles and bones and takes away opportunities for working on other more useful skills. Reply from Dr Pape: I love a controversy! In this case however, I agree completely and thank you for making the point that crawling can be useful in the young infant 10 months and younger that has not already started to commando crawl. After that, working on walking is more beneficial and safer. Thank you for this helpful article. I have been taking care of an infant in foster care, with the hope of adopting her, and she is 11 months old and does not crawl. She gets around by rolling and doing something that might correspond to the “bunny hopping” you mention in your article: she sits on her bottom with her knees angled out and the soles of her feet touching (reminiscent of a popular yoga posture) and pushes her knees up and down to bounce forward. While her preferred method of locomotion looks like it would take a lot of work, she gets around quickly and has little incentive to explore traditional belly crawling, and for some reason, she really doesn’t like to be on her belly. I’ve worried because people say that crawling is related to literacy and important intellectual development, but your article suggests that this is not necessarily the case, unless it’s true that the 30% of people out there who weren’t crawlers are also poor readers. But, until I have reason to be otherwise, I am encouraged.